On May 5, 2015 I learned that I was pregnant to twins. It was such a surreal moment. If you’re familiar with my story, you’ll know I went to the ER at Kapi’olani Medical Center for Women & Children (that morning) thinking I had miscarried. As you can imagine, the flurry of feelings from preparing to hear the worse news to then being told you’re still pregnant (but with twins) is impossible to explain. A few days later, our doctor discovered a third baby. After a month believing we were having quads, our doctor and the ultrasound tech had a bit of a disagreement. The doctor believed there was a baby E, and the tech disagreed. For what seemed like an hour, the doctor kept sliding the Ultrasonic Transducer from the top of my belly to my left, back-and-forth saying “here’s baby D (top middle of my tummy), and here’s another one (far left of my tummy). It was sort of like an itty bitty tennis match happening right before our eyes. We could see what he was seeing, and sure enough, he announced I was pregnant with 5 while confirming baby E was another boy. Now, aside from all the other thoughts of disbelief and excitement that was running through my mind, of course, at some point, I thought about transportation. Ultimately, we settled on two strollers; a triple and a double to start. We then purchased a quad stroller but quickly realized it was way too bulky and got heavy fast with 4 little humans riding along. We not only had to consider the number of people in our family, but the number of “things” that would come along with 5 infants and a toddler. From a family of 3 to a family of 8 with two strollers, car seats and diaper bags, there were many factors we needed to consider. 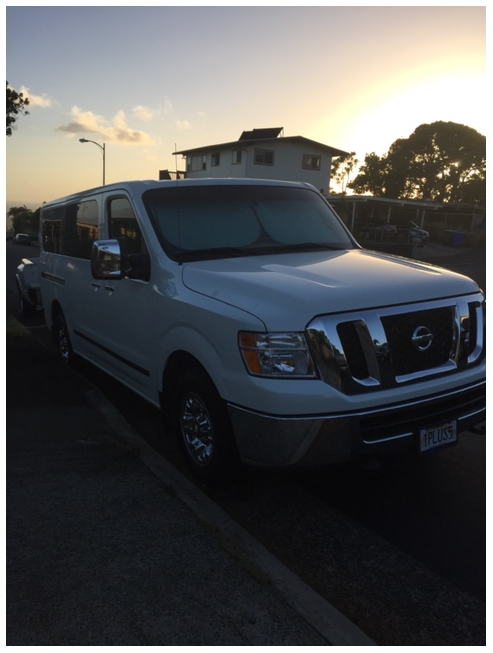 A little more than a month after giving birth to the quintuplets and with help from donations to our go fund me page, we were able to make a down payment on a 12 passenger Nissan NV Van. We decided on this van because it allowed us to reconfigure the seating in many different ways. It’s been over three years now, and we’re still driving around town in our DelaCruzMobile, or what I like to call our Mini-Bus. Nowadays the kids can climb right into the van and sit in their assigned seats and (almost) buckle themselves in. It’s so much easier than having to take them out of the stroller, climb in and buckle each kid in one-by-one. Even Makaio gets into the action and buckles/unbuckles them when we’re out-and-about. People look at us as if we’re crazy. Who’d go to Sam’s Club with 6 toddlers? Well…we do! In fact, since we live close to Sam’s Club, it’s somewhere we frequent regularly. Feeding all those babies gets quite costly so we usually get the essentials like bread, milk, cereal, eggs, pull-ups and wipes from there. It’s one of the only places that they recognize and shout the name to when they see the sign. Just because we have 6 children, it doesn’t mean we don’t take them places. We’re paying a lot for the Mini-Bus, so we might as well make the best use of it. It doesn’t matter where we’re going, as long as the kids are walking out to our van, they’re happy. Often times no one knows where we’re going – including us! We all just jump in the van and let it lead us to a destination. We love pointing out different things and hearing the excitement in their voices. Lately, there’s been a lot of rainbows and the kids get super excited to see all their colors. Did you know that when the babies were infants, that they were assigned colors so we could tell them apart? 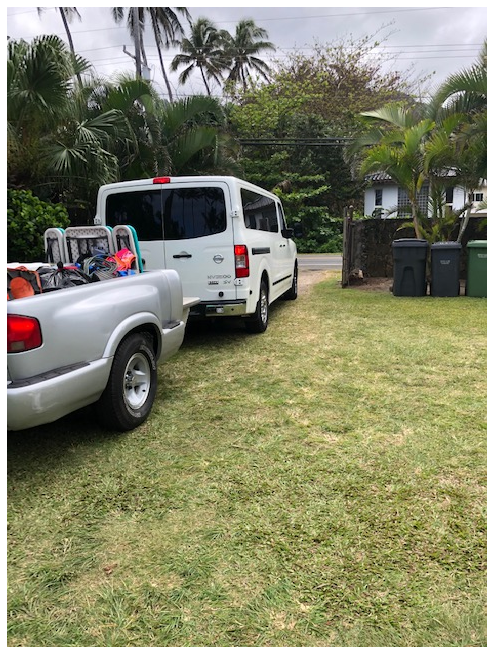 Kapena (Green), Kupono (Blue), Keahi (Orange), Kaolu (red) and our little girl, well, it doesn’t matter…anything pink or purple is “hers”. I’ll share more about their colors next time. Until then, if you see us cruising along, throw us a shaka! Be safe on the roads…there’s precious cargo all around you. When you have a staycation at a beach out with six kids. On our way to the doctor! Proud wife and mama to Makaio and Hawaii’s first set of quintuplets: Kapena, Kamali’i, Kupono, Keahi &amp; Kaolu. Next post: Raising Cane’s Raises Funds for Kapi’olani Medical Center (with some familiar faces)!